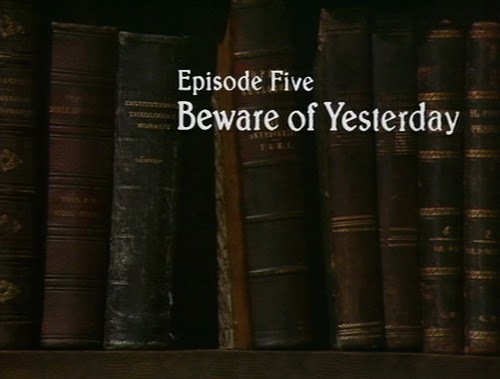 I tend to think of the fifth episode as devoted to Kay’s journey back through time and, as the title suggests, it is the centerpiece. But it takes up barely a third of the proceedings, most of which is devote to the continued aberrant activities of Abner. It is apparently not just the box, but also Cole himself, that Abner prizes. Quite how he intends to gain access to Cole’s abilities is unclear, but he knows better than to dare risk hurting or threatening him. Abner: With the power of the past and the power of the future in his magic mind and although his mind may be fading untold other magic powers as well. Now do you see, you mutinous doddlehead? That mutinous doddlehead being Joe, who continues to feature heavily in this installment; Jonathan Stephens’ performance as a fatuous chump hits all the right notes. Cretinous Joe has a mundane take on everything (he considers the elixir as akin to cough mixture, and views it in terms of its marketability). He has a heart as soft as his pudgy face, and favours releasing the clergy as “a Christmas gesture before the whole thing turns against us”. 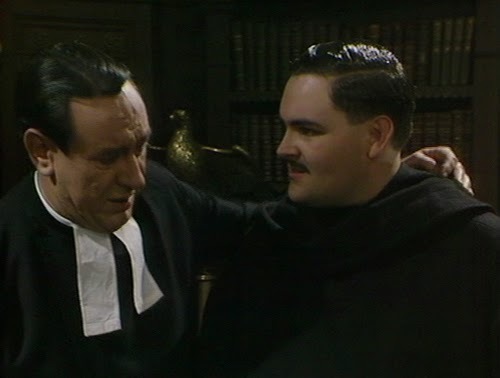 When he meets with Abner again later, he is of even firmer resolve that releasing them is the right thing to do; Abner then introduces him to a cell, inviting him to “stay here and rot forever”. 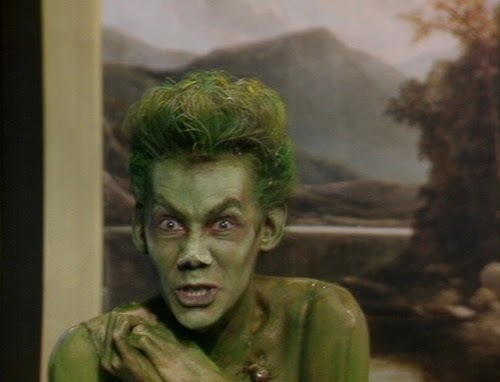 The slightly unnerving Joe of the opening episode, who appeared to transform into a wolf, is long forgotten. 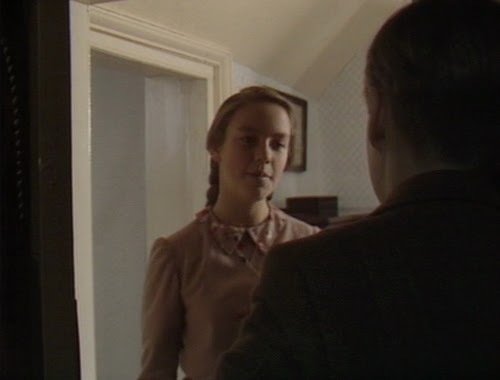 Seymour perhaps doesn’t allow this development sufficient time to settle; no sooner has Joe been locked up than Charles and Sylvia have released him (and there can be little doubt that Sylvia has none of the charitable concerns of the heart that trouble Joe). While their double-crossing is fairly straightforward, the precise nature of Abner’s scheme appears to fluctuate. 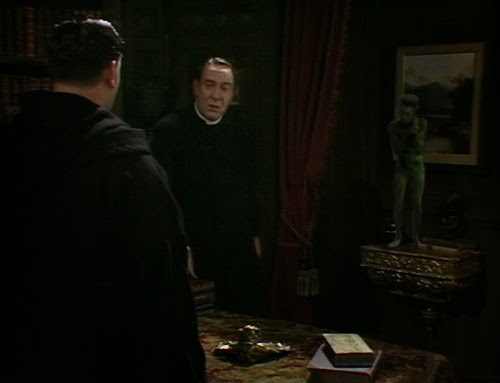 His resolve regarding the box is firm; no one is to be released until it is recovered and he promises that if it is not his “by midnight, I shall stop their precious ceremony if it’s the last thing I do”. Later we find him going through his treasure chest, pondering if half a million pounds is enough for his purposes; he would let the others go hang if only he could get his hands on that box and then head for some far off country (he is undecided regarding the Pouncer; a little too independent, with ambitions of her own, perhaps?) So where would the powers of Cole fit in with this? Would he have to bundle Hawlings away with him to access the elixir? Stephens is tremendous; the mischievous delight with which he informs Joe it is time to give his Christmas lecture to the pensioners again gives Masefield’s tale the air of one who sees many of the proclamations from the pulpit as unfelt regurgitations. 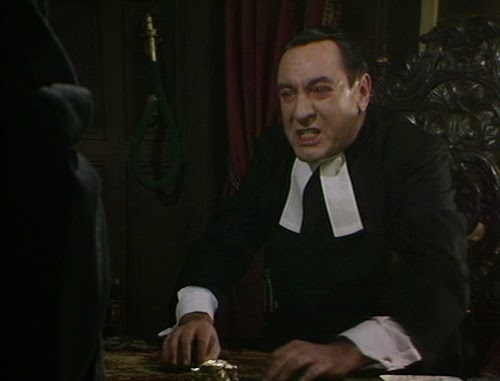 His villainy is prodigious here (“And how is the dear bishop?” he asks the doddering representative of Tatchester, down in the cells) and his intention to enact “One great wickedness before I go!” holds a promise we want to see paid off. Waterfall Boy: You are very near to it. You shall have it under your hand today. The inadequacy of the Pouncer’s advice finally begins to dawn on Abner, perhaps because he is carrying Kay around in his turn-up (“Why do I think of that detestable child Kay Harker?”). But Abner is yet again hoodwinked into wrongful thinking by a cryptic foretelling from the Boy under the Waterfall (Jason Kemp; another young actor with his last billed TV acting credit). We receive the answer to Joe’s (legitimate) question of why Abner cannot use magic to find the box; Cole has put spells around it. 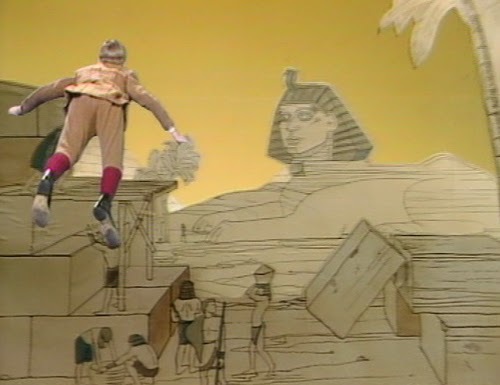 The precise nature of this boy’s predicament is unclear, but Abner is responsible; whatever the properties of his location under the Waterfall, it gifts him with the ability to see the future (he can “see things no one else can see”). 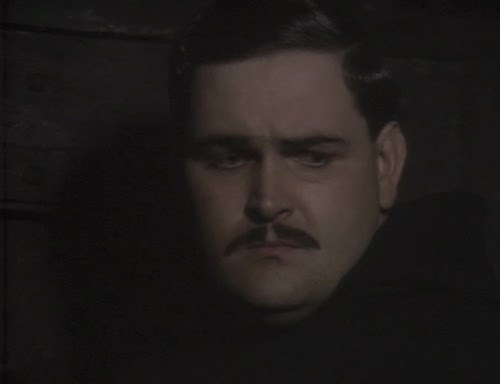 Quite understandably, the boy isn’t best pleased with his lot, so his white lie to Abner is a payback of sorts. The latter regards it as a vindication, and admonishes Joe (“And you tell me to give the whole thing up!”), failing to realise that he has been hoisted by his own petard. 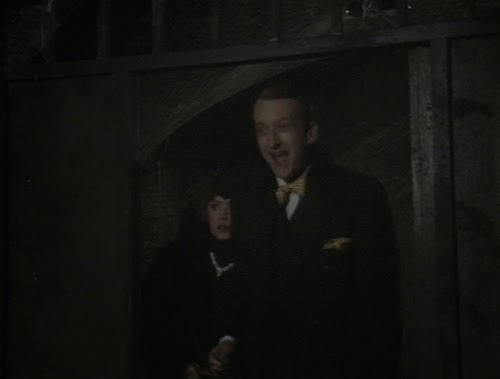 The most amusing exchange of the episode comes just before the boy is banished back to his watery prison. Joe: What will win the Grand National? Waterfall Boy: Kubbader by seven lengths. 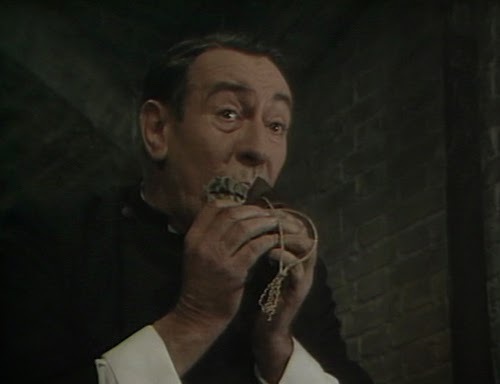 If the clergy look blacker and blacker, the police look more and more incompetent. 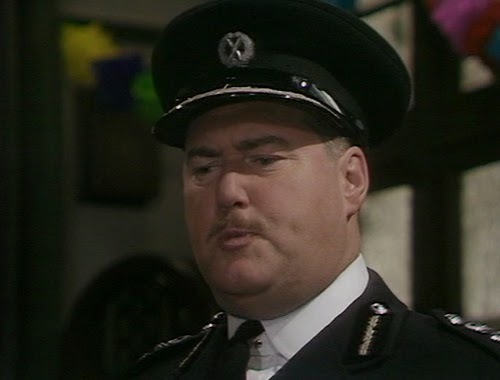 This time, not only does the Inspector berate Kay for his “Hobsession” with the guilt of Reverend Boddledale (Kay calls for a raid of Chesters) but also the oafish Chief Constable (Charles Pemberton) joins in. 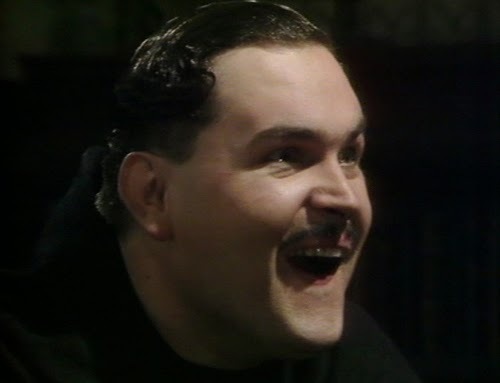 He dismisses concerns that Boddledale is a master crook (“Nonsense boy. Eat your bullseye”), more concerned with laying on protection for the 1000th service. As with the fourth, this episode has something of a sandwich structure, whereby Kay freely leaves the villains lair for an interlude and then returns for the climax. This time, however, he embarks on a journey of the sort not seen since the second installment. At Seekings he calls on Herne, and the familiar surroundings of his bedroom transform into a semi-illustrated/animated backdrop. 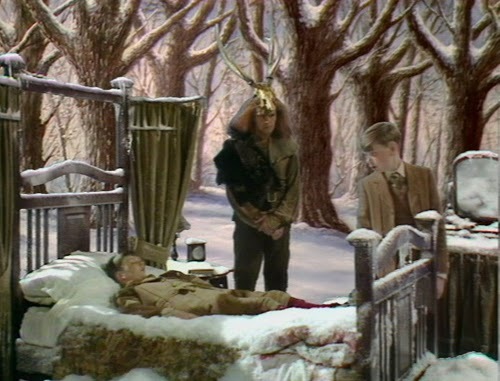 There’s something of a Narnia vibe to a bed amid a snowy forest clearing, while the arrival of Herne has Glyn Baker striking a pose like something out of an Adam Ant video. 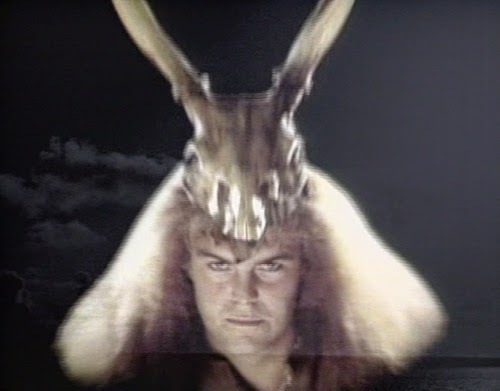 Herne warns Kay that “The past is a great book, with many many pages” and reiterates that the box may not be taken with him on his journey (its curious how omniscient Herne is, aware of the properties of the book; as something of a catch-all representative of pagan Britain, he presumably has such faculties). At this point, the next stage in Kay’s apparent initiation takes place, as he learns to astrally project himself. As a protection, Kay will not enter the past physically. Rather his “shadow” makes the journey; if those who care about him call him strongly enough, he may get safely back. In relative terms, the journey into the past is a disappointment when compared to the luxurious animation of episode two. Rye is clearly conscious of his budget restraints, so he attempts to make a virtue of them. As Kay “flies” into the book of the past, Rye draws attention to the fakery with cut outs of the periods he traverses. When Kay lands on a sandy shore, the sea is an obvious effect. 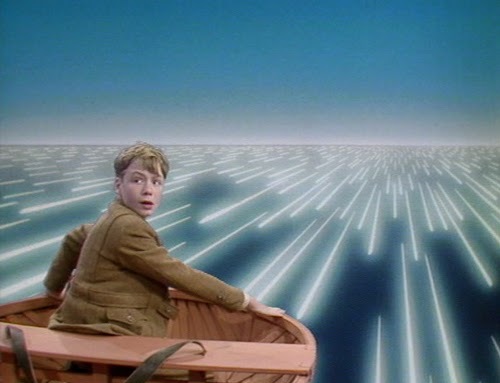 And when he is sent whizzing across the sea to be marooned on the nearest island (by a band of Greek soldiers, very quick to spot he has no shadow, who include a young Julian Sands in their number), the effect is exaggerated; he might be within the computer realm of TRON. His encounter with Arnold of Todi (Philip Locke) is a very studio-bound affair, and one can’t help feel Rye could have made it more atmospheric. 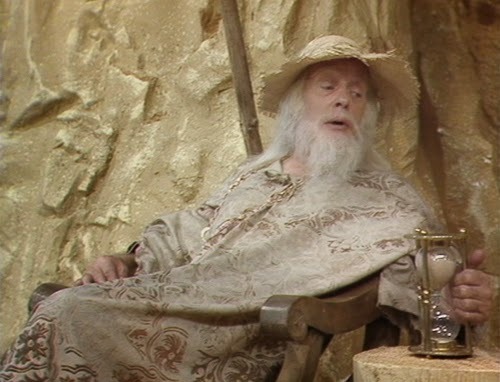 It recalls the White Guardian’s encounter with the Doctor in the Key to Time season of Doctor Who, except that Arnold is not such a natty dresser, nor so erudite. Todi talks in rhymes, confusing dates and times. I wish someone would say. As he tells Kay, “I’ve got quite lost in time”. He confirms Abner’s account regarding the elixir, “But I refused to give it. And now I know not where it is nor where I am”. But filling in the blanks, he clearly regards Cole/Lully with no ill will, considering it “Magnificent” that he lives on. 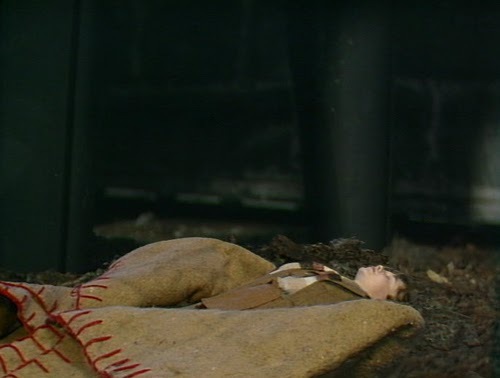 More of a surprise is that he views the box as “a silly little toy” and refuses Kay’s beckoning to return to 1934 and take possession of it. Indeed, he becomes expressedly irate, and we finally see that, for all his aged confusion, this is not someone to be trifled with. 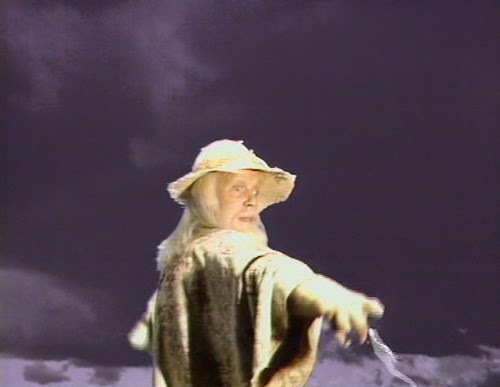 Arnold summons lightning bolts and threatens to send Kay back to the past. 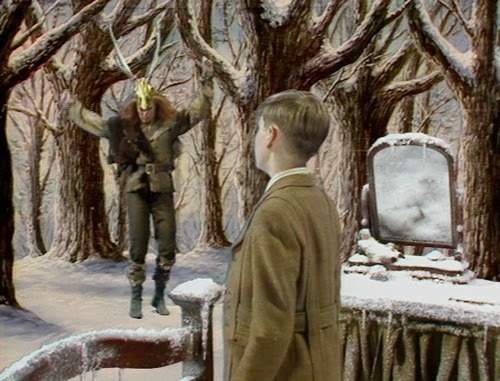 As has been largely the case with the villain scenes, Kay’s return to Chesters finds him playing the helpless bystander. So here, his tiny self travels about in Abner’s trousers before ending up trapped in his treasure chest. And without the box! When Charles and Sylvia raid Abner’s gems they manage to discard Kay, who falls unconscious to the floor. So at least he’s not locked up (might he not have squeezed through the keyhole, though?) this is the third cliffhanger where Kay has been tiny, and the second tiny and in peril. So perhaps Arnold is right; the box is merely a toy, with only so many tricks up its sleeve. Where shall the 'nighted Showman go?